A Nevada state senator is worried about the possibility of violence as the standoff between rancher Cliven Bundy’s family and heavily armed federal agents continued. 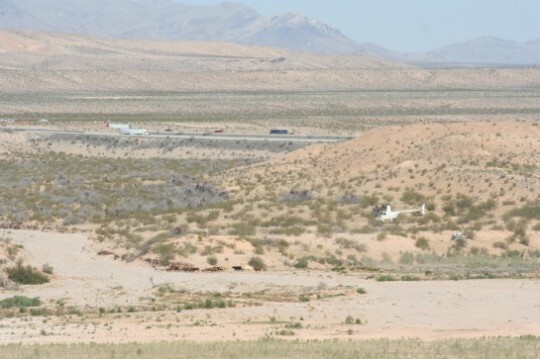 As previously reported by the Washington Free Beacon, an estimated 200 armed officials have surrounded the Bundy ranch, providing security for contractors to remove 908 cows designated by the Bureau of Land Management (BLM) as "trespass cattle." Carol Bundy told the Free Beacon on Wednesday afternoon that there had been "no incidents, yet." Nevada state Sen. Peter Goicoechea (R.) expressed concern that the federal government was exacerbating the problem. "This morning was the first I actually heard that there were military personnel there," said Goicoechea, who is also a public land rancher. "If, in fact, we actually have military personnel down in that area because that equates to martial law." Goicoechea brought up the questionable handling of a previous case by armed BLM officers in the state two months ago. "We have always challenged that BLM Rangers have no jurisdiction or police powers in the state of Nevada," Goicoechea said. "They typically are an unsworn officer. And we had the case where a young man was shot a couple months ago at Red Rock by two BLM Rangers." The BLM officers shot and killed an unarmed young man in February near the Red Rock National Conservation Area, just outside of Las Vegas. A graphic video documented the encounter. BLM officers fought with the suspect, ultimately shooting him seven times when he attempted to get into a Nevada Highway Patrol vehicle and remove an AR-15 rifle from a locked compartment, according to the Las Vegas Review Journal. "He was definitely disoriented, he was unarmed, and they were questioning him, along the state highway," Goicoechea said. "And if you press for this they’ll tell you it’s still under investigation." "They shot him seven times, killed him dead," he said. "They said, well, they thought he was trying to get—there was a highway patrolman there, and they said it looked like he was trying to get into the highway patrolman vehicle, and we were afraid he’d get the shotgun out of there. So they shot him. They killed him." BLM officials arrested Dave Bundy, Cliven’s son, on Sunday, for taking pictures along a blocked of area on state highway 170. Carol Bundy said the officials "bruised him up pretty good," and held him for 24 hours. Goicoechea said this is not the first impoundment of cattle in the state, but typically county governments have handled public safety. A former county commissioner, Goicoechea said he never allowed for any roads to be closed. "Don’t get me wrong, [impoundments] aren’t without incident," he said. "The feelings run very high." Like the Bundys, Goicoechea’s family has ranched in Nevada for more than a century. "Those of us that have spent generations here, my granddaughters are still pounding cows down the same trails my grandfather did," he said. "We’ve been here well over 100 years, and livestock is our living, and by hook or crook we’ve ended up in some kind of politics." The dispute between the Bundys and the BLM revolves around unpaid "grazing fees" and public land that has been closed off to protect the "desert tortoise." The BLM designated 186,909 acres of the Gold Butte off limits for the "critical desert tortoise" population in 1998. Bundy had already lost his grazing permit five years earlier for refusing to pay fees for the land, which his family has ranched since the 1870s. Since the 1800s ranchers have taken up homesteads and used land for their cattle herds. Ranchers abided by the "Three-mile Water Law," which entitled them to grazing rights for land three miles around water the rancher owned or maintained. Disputes were settled amongst the ranchers themselves. "There have been people shot through the last century over grazing disputes," Goicoechea said. "There’s no doubt about it." Until 1934, disagreements over the land were not adjudicated. The "Taylor Grazing Act," signed by President Franklin Roosevelt, set up districts for grazing on public land, and issued permits to ranchers for a more orderly process. However, those permits for the majority of Clark County—including the permit for the Bundy Ranch—were transferred in 1998 to the Habitat Conservation Plan to protect the desert tortoise. The tortoise is protected under the Endangered Species Act. However, Goicoechea says they don’t need any protecting, citing a recently passed Nevada regulation that imposed a one tortoise limit per person to "reduce the overbreeding and proliferation of unwanted pet desert tortoises." "People will get two or three of ‘em and all of a sudden they come home one night and you’ve got 15 of ‘em," Goicoechea said. "I guess they’re diggy little boogers, they go under sidewalks and patios. So tortoises were causing damage in their neighbors’ yards." "We’re talking about an endangered species that in fact went out there and removed all these people off the public lands under the intent of protecting that desert tortoise," he said. "They have adapted, and they’re doing very well." The Fish and Wildlife Service lists the species as "threatened."